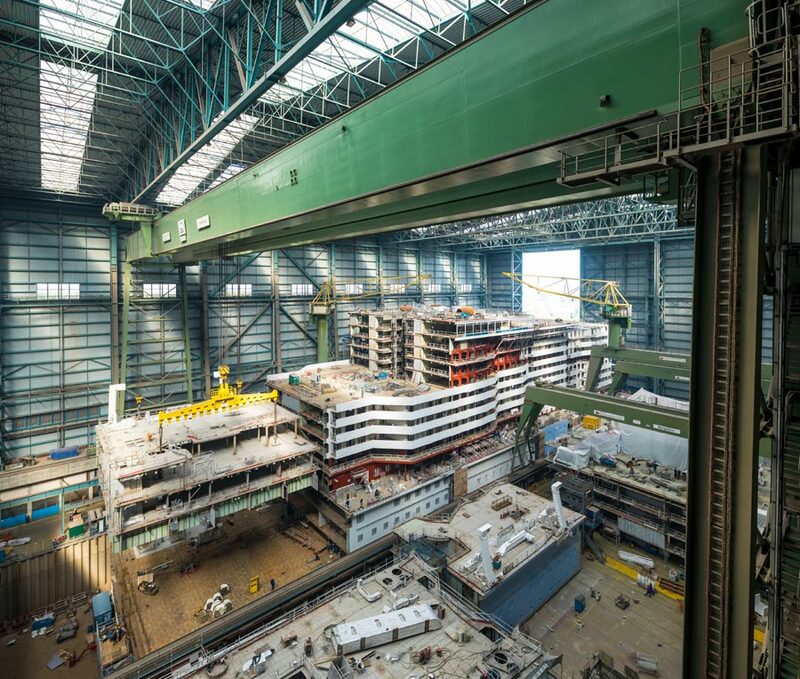 Royal Caribbean has released some new photos of Spectrum of the Seas while under construction at the Meyer Werft shipyard in Papenburg, Germany. 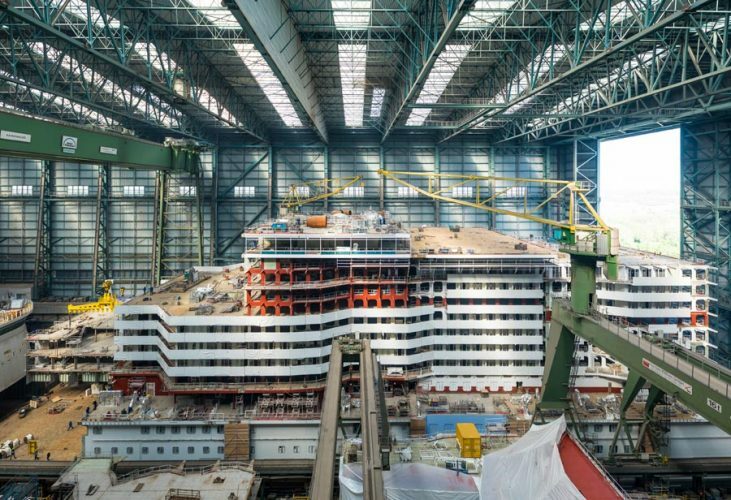 There is still a way to go but if you love cruise ships like us you’ll enjoy taking a look at the ship before being completed. The new batch of photos from the shipyard in Germany was taken in May 2018. Construction has come far since the last time we posted Spectrum of the Seas photos in January 2018. We’ve also covered one of the major blocks which makes up the ship. The major block was built at a separate shipyard in Rostock. Without rambling on any further let’s just get into the new photos of the next Quantum Ultra class ship for Royal Caribbean. Here is one huge section of the vessel which looks to be mid-ship. There are many smaller blocks which have come together and workers will continue to make sure the core frame of the ship gets completed. What looks like the same section but taken days before as a smaller block is being positioned for attachment to the main part. 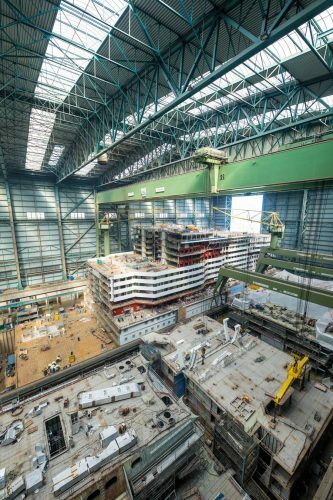 Another view of Spectrum of the Seas while being built at the Meyer Werft shipyard in Germany. 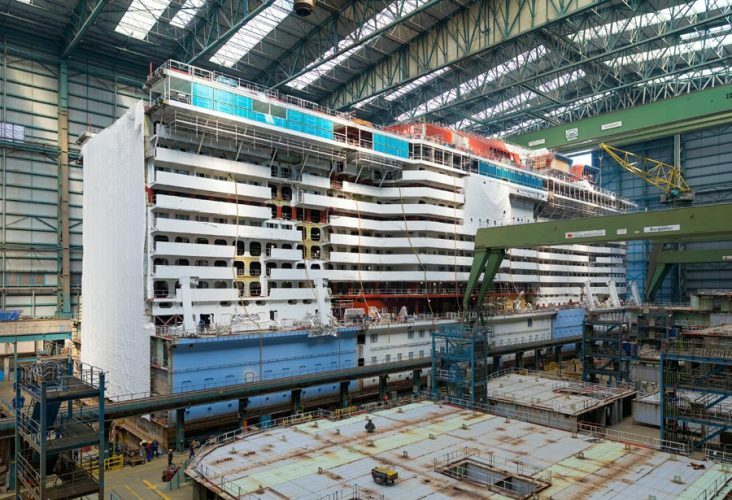 The majority of the Royal Caribbean ship is being built inside the hall but some other parts high up on the open deck will be added after she leaves the hall yard. Another view of the ship from the side as she comes together block by block. The next major milestone will be when the ship floats out on to the water for the very first time. As always, Cruise Hive will be around to post about it. Spectrum of the Seas will be an evolution of the current Quantum-class ships which started from Quantum of the Seas. Once completed the future ship will be 168,800 gross tons and have a passenger capacity of over 4,000. The U.S might have t wait a while to experience the new ship as it is being purpose-built for the Chinese market. The ship will arrive in 2019, expect further details to be revealed from the cruise line in the coming months.